This year GAU organizes a large volunteer program – series of events and trainings aimed at development of volunteer potential of LGBT movement in Ukraine. The closest upcoming event is 2 days LGBT bike ride. It will be held in May and confined to the International Day Against Homophobia (May 17 – editor’s note). The participants of the bike ride will cover over 140 kilometers from Kyiv to Zhytomyr. The rules of the ride and registration forms will be published soon. Currently the itinerary of the bike ride is being accorded with law enforcers for safety and security arrangements. We invite volunteers, activists and GAU associated members to join the event. 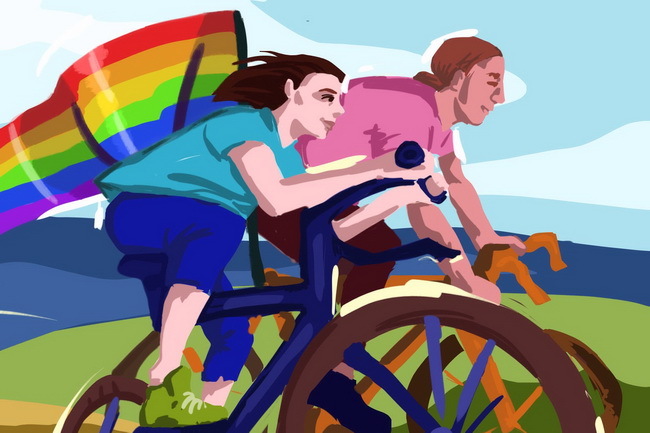 We also welcome all tolerant people and members of different discriminated groups that would like to support LGBT movement by participating in the bike ride or providing their brand marks to the participants. Additional information is available via [email protected]. Let’s recall that 3-day training for volunteers aimed at volunteer movement and Queer Home community centers development was held in February and welcomed over 30 volunteers. They took part in workshops, seminars, hands-on trainings focused on teambuilding, conflict situations analysis, working with initiatives and project launch. Also volunteers visited Munich in frames of GAU and contact group Munich Kiev Queer program in April. During 10 days they were meeting German volunteers working with different groups.